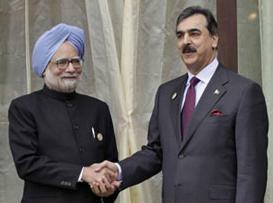 29 Apr : India and Pakistan have decided to resume dialogue at the level of Foreign Ministers soon as Prime Ministers Manmohan Singh and Yousuf Raza Gilani met in Thimphu on Thursday in their first substantive engagement in less than a year. During their meeting, Dr. Singh and Gilani decided that the channels of dialogue between the two countries should be kept open to restore “trust and confidence” in the bilateral relationship. This was their first meeting after their dialogue in Sharm-el-Sheik in Egypt on 16th July 2009 following which a major controversy had broken out in India on the contents of the joint statement. Terrorism and the “slow progress” of Pakistan’s probe into Mumbai attacks formed part of the agenda of the discussions which were held at the ‘Bhutan House’ in Thimphu on the margins of the SAARC Summit. “The Prime Ministers held very good talks in a free and frank manner. They agreed that cooperation between the two countries is vital for the people of South Asia to realise their destiny,” Foreign Secretary Nirupama Rao told reporters. “Prime Minister expressed India’s concern over the slow progress of Mumbai trial in Pakistan to Prime Minister Gilani,” Rao said. Dr. Singh told Gilani that India was willing to discuss all issues of mutual concern through dialogue but the issue of terrorism is holding back the progress, she said. The Foreign Secretary also said it was decided by the two Prime Ministers that Foreign Ministers and foreign secretaries of the two countries should meet as soon as possible to “restore trust and confidence” in the relations, said Rao. Pakistan Foreign Minister Shah Mehmood Qureshi told a news conference that the meeting between the two leaders ended on a positive note and he would be engaging with his Indian counterpart S M Krishna at an appropriate time. He also welcomed Home Minister P Chidambaram to Islamabad on 26th June for the SAARC Home Minister’s conference. Qureshi said the meeting has “changed the climate” between the two countries. Asked whether the Foreign Ministers-level talks amounted to resumption of the Composite Dialogue process between the two countries, Rao said she does not want to get into details about the nomenclature of the talks. To another question, she declined to go into details of the issues that would constitute the talks, saying “all concerns” would be discussed. Dhamija enters Final in Sub-Jr. Snooker, Makkar, Lehri enter next round of Sr. Billiards.